In politics there is a saying that “a week is a long time (in politics)…” What a week of scrutiny for Moana in particular. She is a tough girl and weathered the media storm graciously. After all, media focus is what this game needs! Moana silences the critics by blasting an opening goal for the Pies. There is a “shift” within the Pies tonight. Cannot put my finger on it…yet! No finals this year for my girls yet, that seems to be the farthest thing from their minds. The game is fluid, rough, exciting. Nicole Stevens (21 Pies), her hair-band catches my eye. As a black and white fashionista even I baulk at the choice of colour only to learn she wears this band to honour her mother who is living with Alzheimers. Stats flash up proving my perception of the game incorrect – Doggies are nailing ball contact. Back to fashion, last year Australian company Cotton On Group worked with leading women players Daisy Pearce, Lauren Arnell and Aasta O’Connor designing a range of practical and comfortable clothing. My question (and this is a serious question) is what do the women players wear underneath to protect themselves? Second half, both teams are fighting to get possession and move out of the centre. Doggies stifled within “a nest of magpies”. Pies are more disciplined in this quarter. Pies Emma King (60) is dominating yet the Doggies are running low and hard. Awesome passing techniques Doggies! Nice footwork Caitlyn Edwards (1 Pies). Doggie Kristen McLeod is off the field with a neck injury. The pace does not slow. Cecilia McIntosh (20) and Lauren Tesoriero (7) for Pies discard Doggies who dare to get in their way as they fight for possession. Nice mark Lauren. Everyone winces as Kate Sheahan (24 Pies) goes down with a twisted knee. This is so unfair – her first game back! Her pain and disappointment are etched across her face as she is carried from the field. The half time stats prove again that the Doggies are playing better than the Pies. Kate returns to the field on crutches. Pies continue in the lead with a D’Arcy goal (4). I am willing the girls to strike another blow – we need this win. Emma King (60 Pies) reads my mind – good shielding, wall building is improving against the relentless doggies. “Skills, girls, skills”, quips one of my best friends (who will remain nameless and dropped my delicious salmon patties dinner on the inaugural night at Ikon Park four weeks ago only after ONE mouthful). Instinctively I “shield” my dinner from her! Goal! Wahoo – awesome teamwork by Jess Cameron (27 Pies) who sets up Alicia Eva (2 Pies) to deliver a goal beautifully. This time next year we will be in the Grand Final – that is my prediction. That is what has changed tonight – we are fluid – we are a team machine! Alicia Eva comes back for another attempt at goal. Moana is swamped by Doggies. Jasmin Garner (43) powers in and kicks another Pies goal. 16 point lead. We can “smell blood!” Doggies have their collective tails between their legs. We are not watching women play football – we are watching footballers! Apologies anonymous friend I pinched that statement – love it! Fourth quarter .. “who let the dogs out…”! Meg Hutchins (25 Pies) is a hunted woman, closely followed by Stephanie Chocci (17 Pies) with nipping Doggies at her heels. Tempers are fraying. 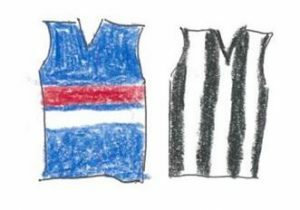 Pies play backward passing tactics – No! We should be on the attack. Minutes tick by painfully slowly .. 6, 5, 4, 3, 2, 1 … siren blasts. Collingwood’s first win for the season. I collapse. What a night, my team wins, Kate is up and about much to all of our relief and I got to devour ALL of my yummy salmon patties – see, the balance did return! Hi Lyn, great article. I will NEVER live the salmon pattie episode down. The Pies really lifted, especially after Kate did her knee. Pride was on the line.